Salman Khan who recently wrapped up the shoot of Ali Abbas Zafar’s Bharat is all set to start shooting for his next film Dabangg 3. Reportedly, the film that features Sonakshi Sinha as well in the lead will go on the floors in April in Madhya Pradesh. Reportedly, Dilip Shukla has been working on the script and the screenplay for a year now and the makers will now lock the dialogue draft too. The film also stars Kannada actor Sudeep in a negative role. 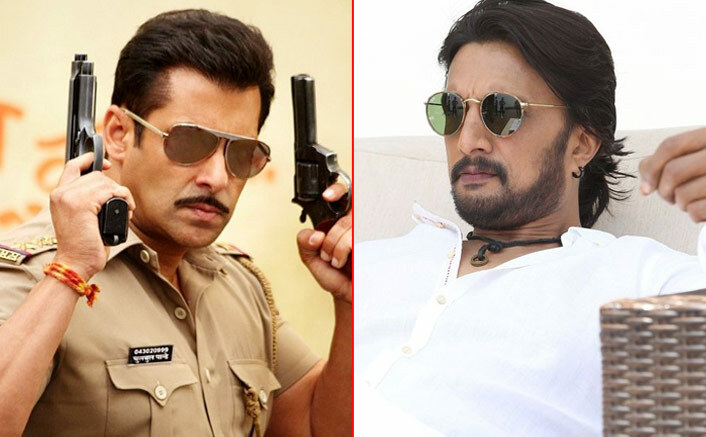 A leading tabloid reported a source, “Unlike the last two films, this one is more contemporary, as Salman’s Chulbul Pandey engages in a cat-and-mouse game with his antagonist, Kannada actor Sudeep, whose character is almost like a parallel lead with extreme dark shades.” The makers are trying to keep the third installment different than the first two films and hence Sudeep has got a meaty role as compared to the previous antagonists. He will be seen as a second lead in the film. The franchise’s music has always been a highpoint of the film and this time around Sajid-Wajid will be composing for Dabangg 3. The tabloid further quoted the source, “The Dabangg brand has been synonymous with songs that have a long shelf-life. Four songs have been finalised following several sittings with Salman. This album will ride on five to six original songs.” Apparently, Salman wants the title song to be a tribute to the late Jalees Sherwani who penned Hud Hud Dabangg and Dabangg Reloaded from the first two films. Jalees passed away last year on August 1. However, what comes as surprise is the fact that no item song will be featured in the film. The first two films had the hit songs Munni Badnaam Hui and Fevicol Se. However, it is reported that a big surprise is in store. Dabangg 3 is produced by Arbaaz Khan and directed by Prabhudeva will be shot over a period of four months from April to August. After the Madhya Pradesh shoot the team will head to Wai for a marathon shoot as the plan is to release the film in December.